MANCHESTER: A thumping header from Wayne Rooney ended Manchester United’s scoring drought and secured a 1-0 Champions League victory over CSKA Moscow as they went top of Group B on Tuesday. United seemed to be heading for a fourth successive goalless draw before Rooney met a Jesse Lingard cross and sent a bullet of a header soaring past CSKA keeper Igor Akinfeev and into the roof of the net in the 79th minute. It was the England striker’s 237th goal for the Old Trafford outfit and drew him level with Denis Law as the club’s second highest scorer, 12 behind Bobby Charlton. Despite dominating possession throughout the encounter, United had struggled to break down the resilient Russians whose own attacking ambitions were limited to infrequent counter attacks. United, who had previously failed to score in Premier League encounters against Manchester City and Crystal Palace as well as a League Cup clash against second tier Middlesbrough, mustered little more than half chances until Rooney’s winner. The result left the group perfectly poised with United on seven points, one clear of VfL Wolfsburg and PSV Eindhoven, who won 2-0 at home to the Germans on Tuesday. CSKA are bottom with four. “It is unbelievable because we created at least 12 chances tonight and had to wait a long time,” United manager Louis van Gaal told BT Sport. “Before that they could have scored and then it is a different match. I am happy. We played well.” United began brightly, fizzing the ball around the slick surface with intent. Their possession, however, counted for little in the opening 45 minutes with a succession of half chances coming to nothing as the home crowd grew increasingly restless. 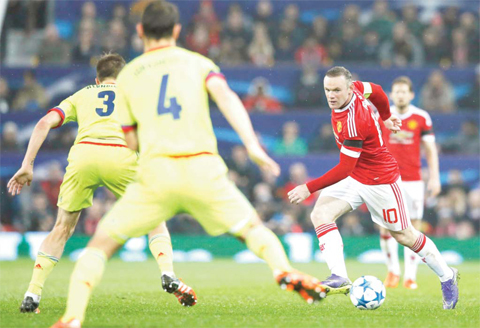 Rooney, whose form had been questioned after scoring only two Premier League goals this season, flashed an effort fractionally wide after three minutes and then almost latched on to an under-hit back pass before Akinfeev cleared the danger. CSKA, who won 2-1 at United’s neighbours Manchester City 12 months ago, were happy to keep men behind the ball and barely threatened Van Gaal’s well-drilled rearguard.